Join me on my quest to attend all 162 Brewers games during the 2012 season, while raising awareness for the Be The Match Registry along the way. Friday did not go as we originally planned, but I think it all worked out in the end. Victoria and I were planning on meeting our friend Allison at Pixar around 11:30, and she was going to give us a tour, and then we’d have lunch there. At 8:47 Allison texted me saying that we should “Stay tuned about Pixar, they’re evacuating because of a chemical leak across the street right now.” Awesome. At about 9:30 she let us know that she was coming home from work because no one was allowed to be there. I think we’re going to try and go on Sunday morning before the game, so I’m hoping we can make that happen. When Allison got back the three of us decided to head down to Fisherman’s Wharf, even though it’s what typical tourists do. 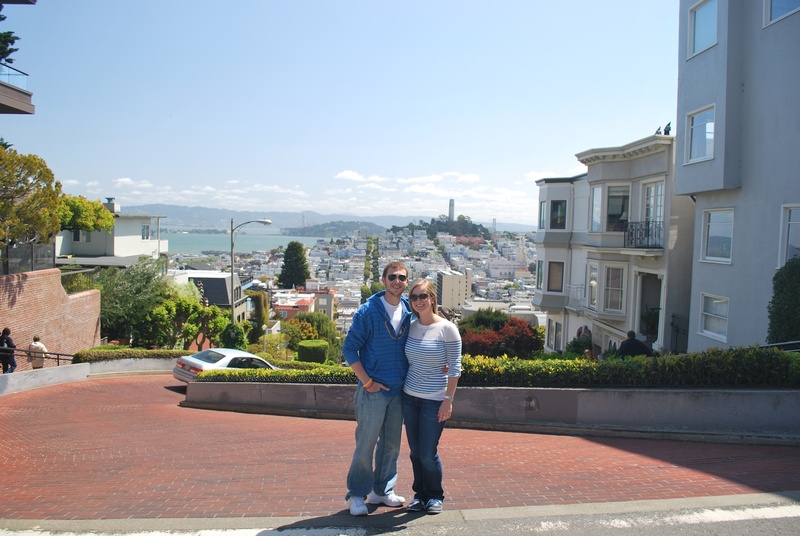 We started by hitting up Lombard street, which is just a few blocks from Allison’s place . 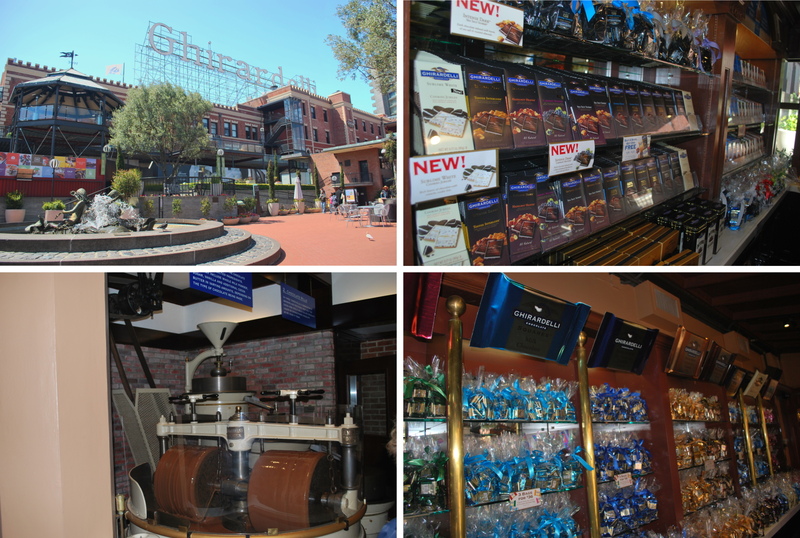 4) Part of the display that shows how they make their chocolate. I wonder how often they change out the liquids. They also have an ice cream parlor where they sell expensive ice cream and shakes. Victoria and I had a Mint Quake Shake. Not sure if it was worth the $6.95, but it came close. 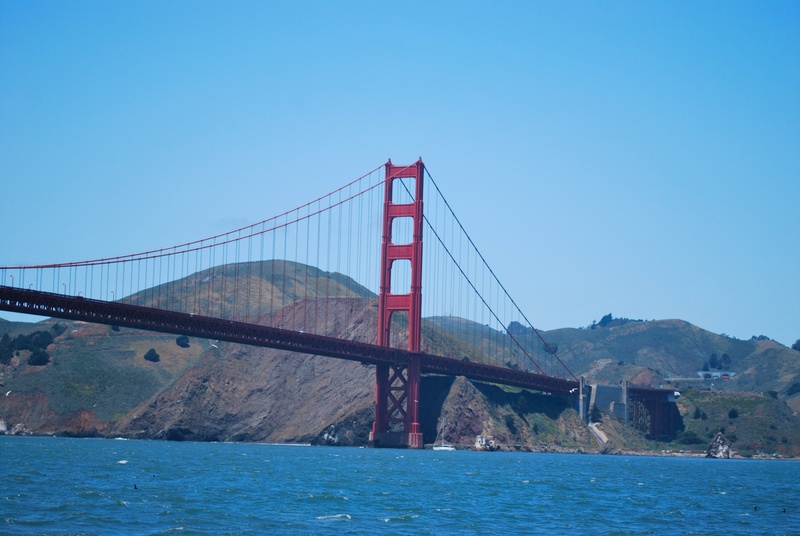 We walked around the square for a little bit, then went down to Fisherman’s Wharf. 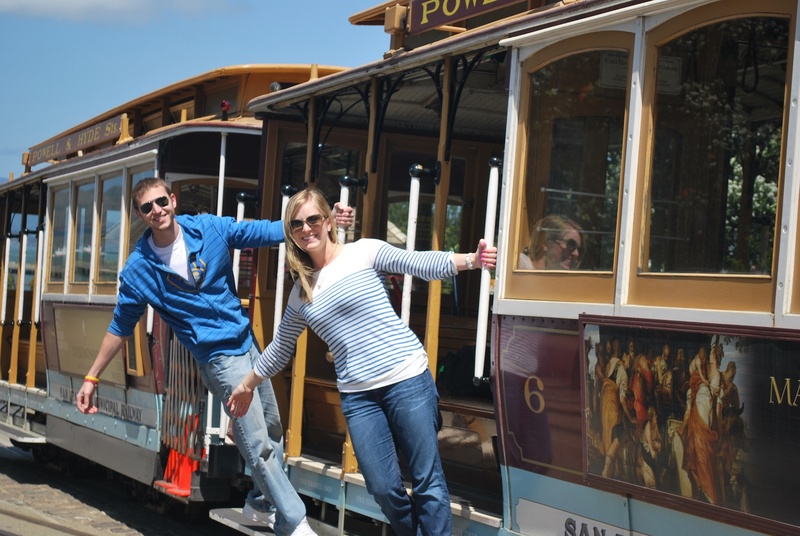 We spotted a cable car that wasn’t in service at the time, and took advantage. It’s corny and cute at the same time. We walked by some of the boats, and one of them was giving an hour long “cruise” under the Golden Gate Bridge and around Alcatraz. For $15 a person, we figured it was worth it. They were almost full so the three of us didn’t really have seats, and we stood for most of the ride. 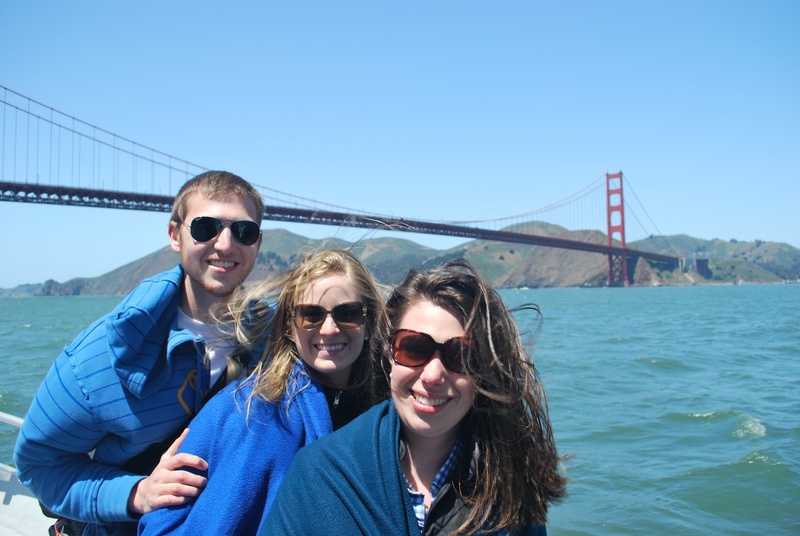 We chose the front of the vessel, and subsequently got splashed pretty good on our way towards the bridge because we were going against the waves. 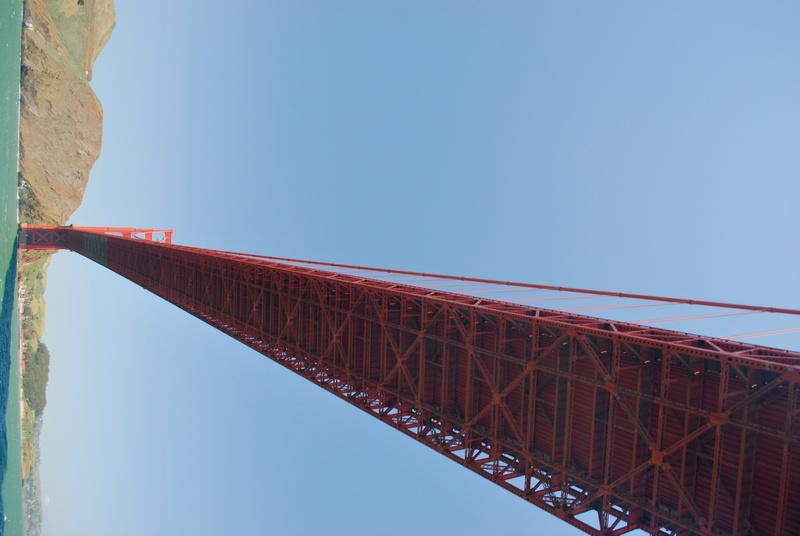 Since the bridge is so long, you can only get the whole thing when you’re pretty far away. As we got closer I could get some better pictures, but it was tough. We were bouncing on the water pretty good, and it was difficult to stay steady enough to take a picture. Once we turned around and went with the current, it was a much smoother ride. One of the tour guides was walking around offering to take pictures for people, and we obliged. If your new to the blog, that’s myself on the left, Victoria in the middle, and our friend Allison on the right. 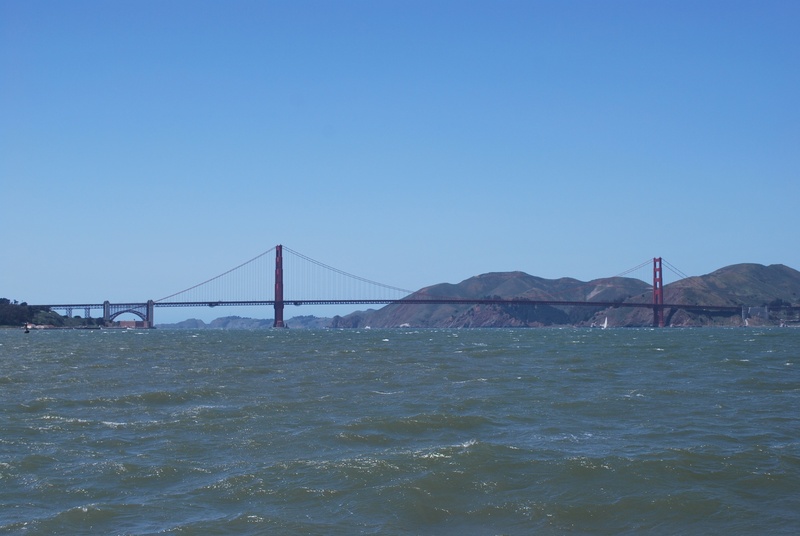 When they said that we would go under the Golden Gate Bridge, and then turn around, they weren’t lying. This is as far as we got, I like the picture because it captures the Bridge’s span. It’s a little overexposed, but I still like it. 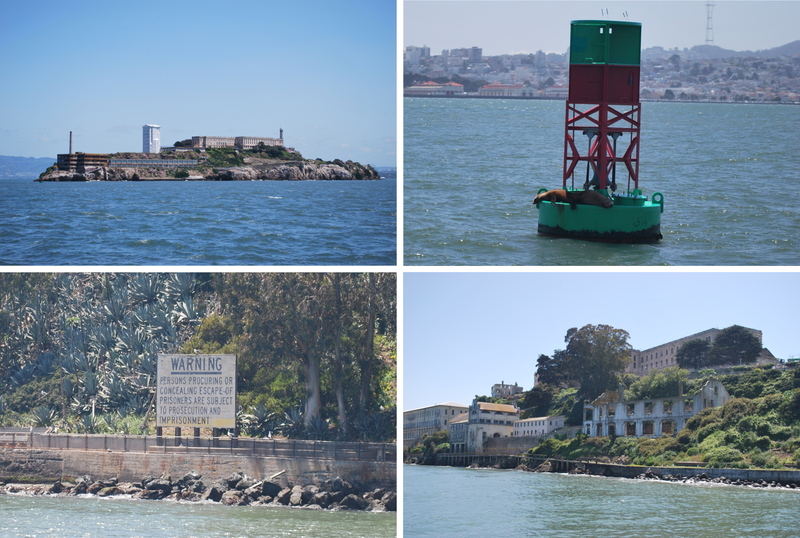 3) Alcatraz from the north. The building missing the roof held a two lane bowling alley on the first level and a dance floor on the second floor, for the prison guards and their families. The 70 or so prison guards and their families lived in the building on the far left side of the picture. The kids would take a ferry to the mainland in the morning, and then return in the afternoon. 4) The warning sign on the southeast side of the island. Marcus Hanel, the Brewers catcher, told me on Wednesday that some of the Brewers were taking a tour of the island on Thursday, and it’s something I probably would’ve enjoyed. Our tour guide said that you have to book way in advance, and during the summer they might be booked a month to two months in advance. By the time we got off the boat, it was 1:30, and we were ready for lunch. I was up for some crab cakes, and we wound up at Pier Market Seafood Restaurant on Pier 39. 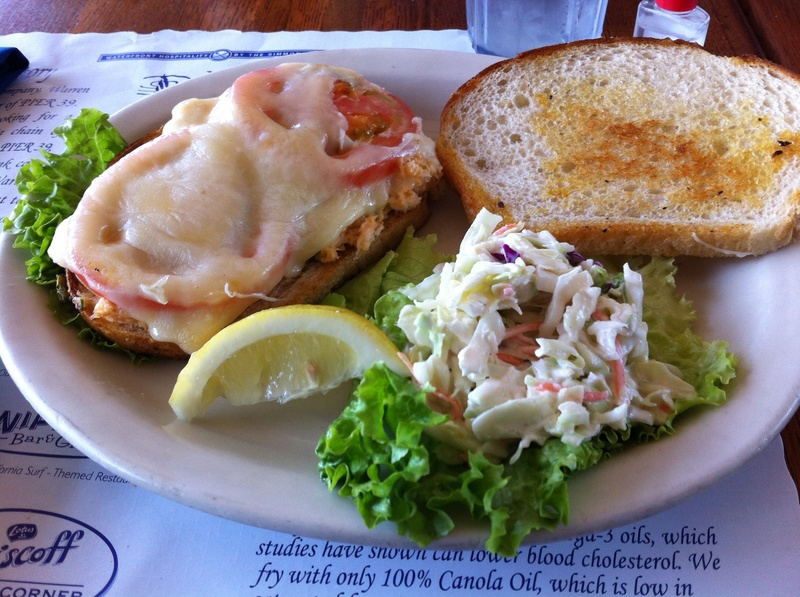 At the last second I backed out on the crab cakes and went for the Crab Melt. I think I made the right call. 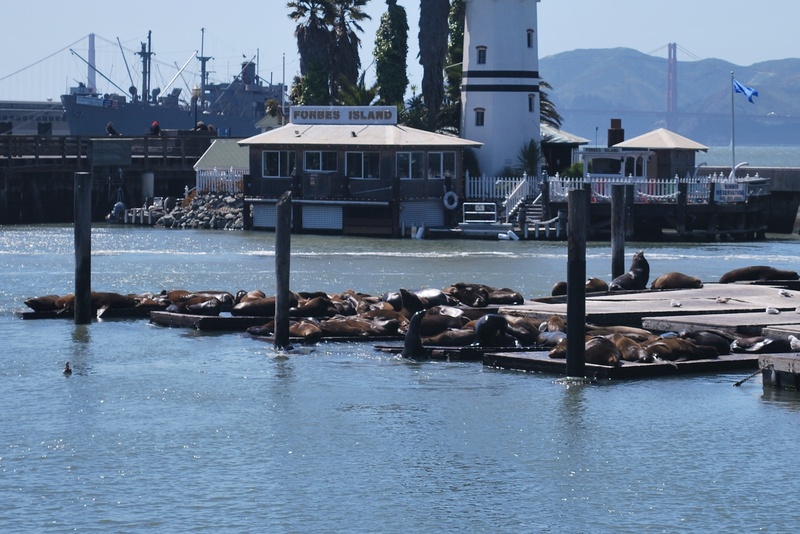 As we were leaving the restaurant there were a bunch of sea lions resting on a dock. It must get tiring chasing fish all day. We walked back to Allison’s flat, and got ready for the game. Victoria and I took the bus down to AT&T park, arrived at 5:15, and met up with a friend of mine from High School. We’ve been friends since about 3rd grade. I can’t help but show a picture of him from elementary school. It’s either kindergarten or first grade, and it’s awesome. My friend Dustin, who lives in Denver now, had this at his house a few years ago, and I snapped a picture of Adam, not knowing if I’d ever use it. The time has come. I’ll be embarrassing myself at a later date with pictures from my childhood, but I don’t have any with me, so they’ll have to wait. 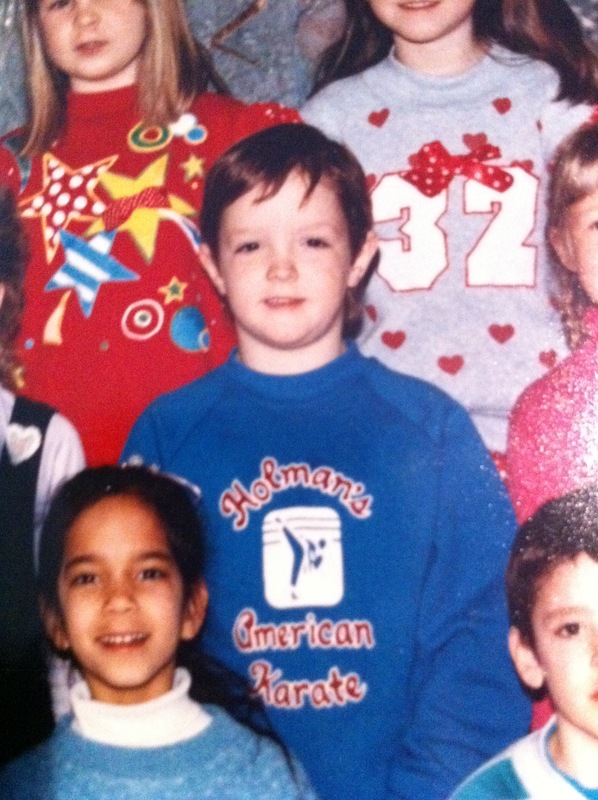 Adam is in the “Holman’s American Karate” shirt, this picture dates to 1993 or 1994, I believe. 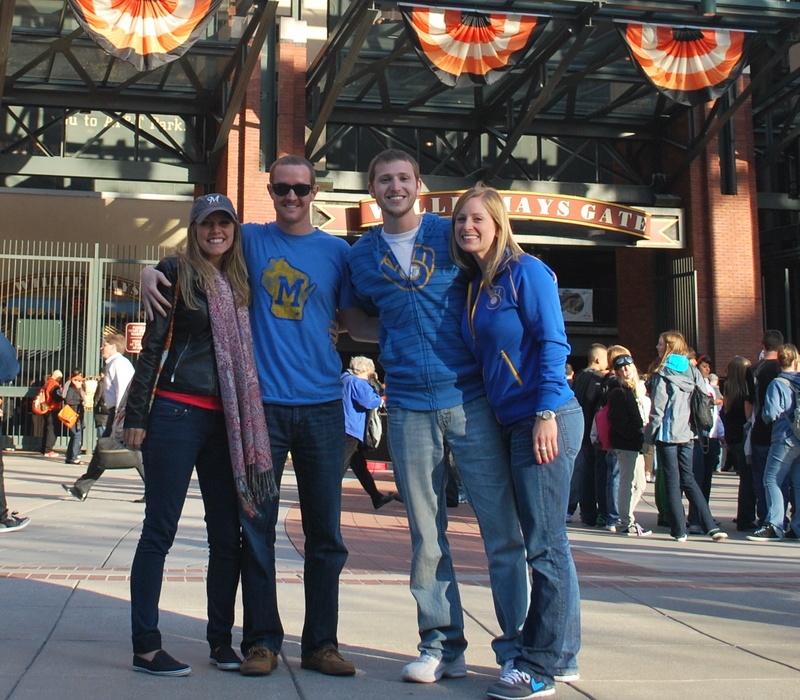 A nearby Brewers fan took a picture of the four of us. From left to right is Adam’s girlfriend Sam, Adam, myself, and Victoria. I had my game number picture taken from the same spot. We went inside with about 25 minutes before first pitch, and walked around. Victoria and I were sitting in the upper deck, and I chose to do so on purpose. 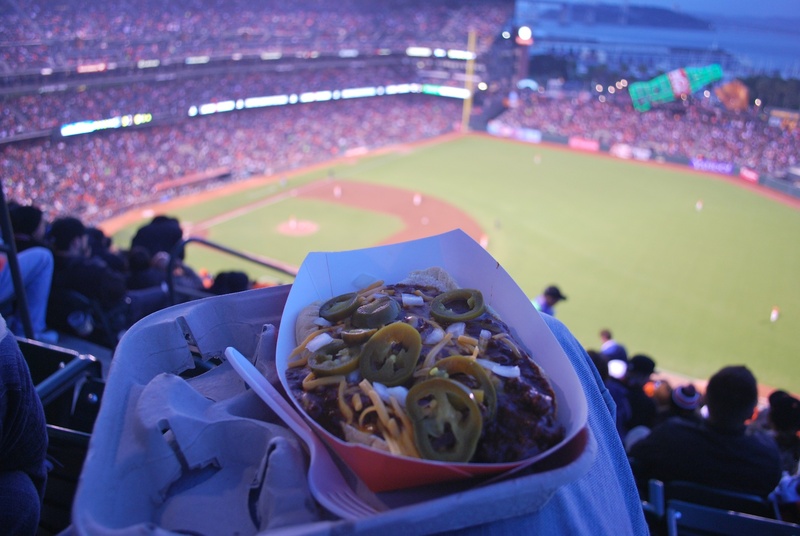 I knew that it would give me the best vantage point of the bay and the ballpark. 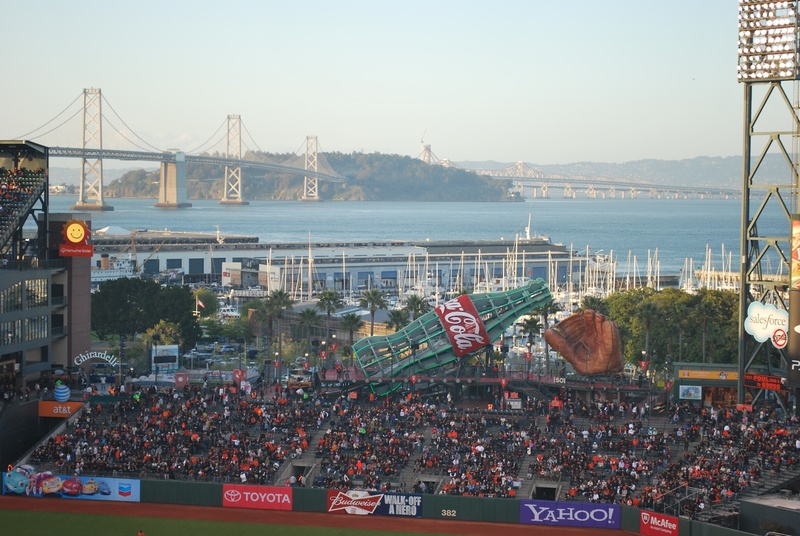 Below is the Bay Bridge on the left, the large Coca-Cola bottle (with a kid’s slide inside) and an extra large baseball glove. 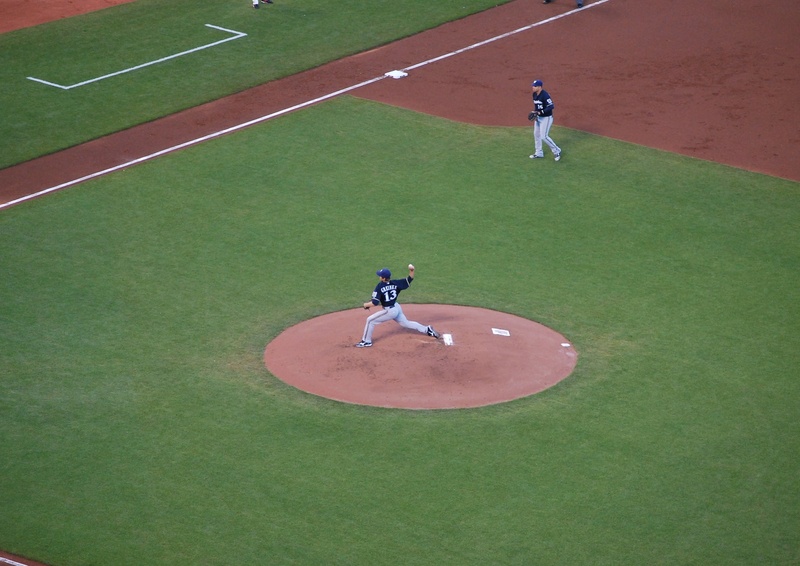 Despite my seat location, I was able to get a good picture of Greinke pitching in the first inning. The Brewers got off to a great start with three runs in the first, mainly because the Giants’ starting pitcher, Tim Lincecum, was quite wild. A big single by Lucroy drove in two runs, and the Brewers held the 3-0 into the fifth, when the Giants put one on the board. The Brewers got it right back in the sixth on ANOTHER suicide squeeze, but the Giants answered and tied it up with three in the bottom half of the sixth. The Brewers came right back with two runs in the seventh, both coming home on an Aramis Ramirez single. Veras, K-Rod, and Axford retired 9 of the 10 batters they faced in the 7th, 8th, and 9th, and the Crew was victorious. Final Score: Brewers 6 – Giants 4. I missed two pitches during the game. The first was really bad. Victoria and I both had to go to the bathroom, and there were Brewers fans behind us. Instead of just telling them what they needed to know, I elaborated. I explained how I didn’t want to miss pitches, and was going to head down with two outs to watch from the bottom of the stairs, so I could get to the bathroom and back quickly. We wanted them to watch our stuff, thus the explanation. As I was doing that I missed the 2-0 pitch to Gomez in the bottom of the second. I’m an idiot. I also missed the first pitch to Hector Sanchez in the 9th. Before the bottom of the inning they showed a highlight from Cheers, and Woody Harrelson was in it. I was trying to think of what movies I would’ve seen him in, but couldn’t remember. Victoria was looking it up on her phone and I spaced out. It’s a pretty lame excuse, I know. After the game I had to meet up with a friend of my sister who had graciously gotten me two tickets for Sunday’s game. We were planning on taking one of the buses to meet her, but it never showed. Long story short; we walked two miles to meet her at a bar that we were way underdressed for, and then walked the mile back to Allison’s place. Overall, I think I walked about seven miles yesterday, probably not the best thing to do with a bad knee, hopefully walking on it doesn’t worsen the prognosis. One last photo. 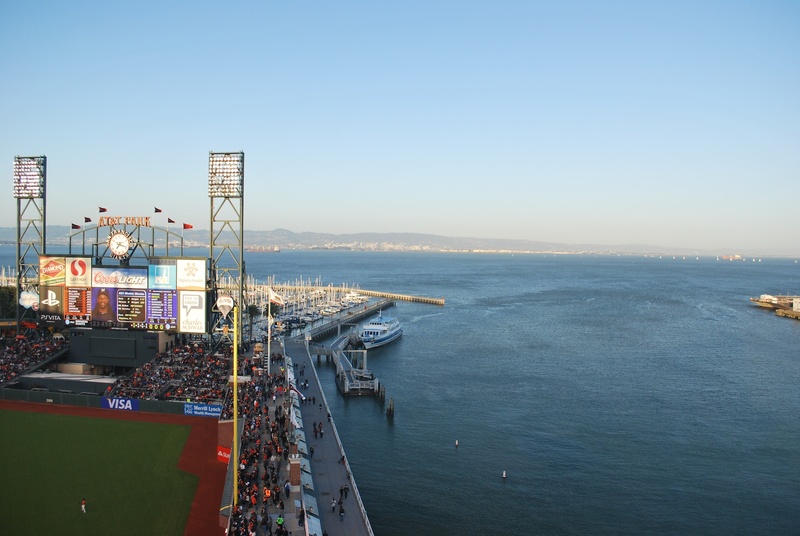 During the game there was one canoe in the bay to our right (where 50 or so would’ve been when Bonds was playing). 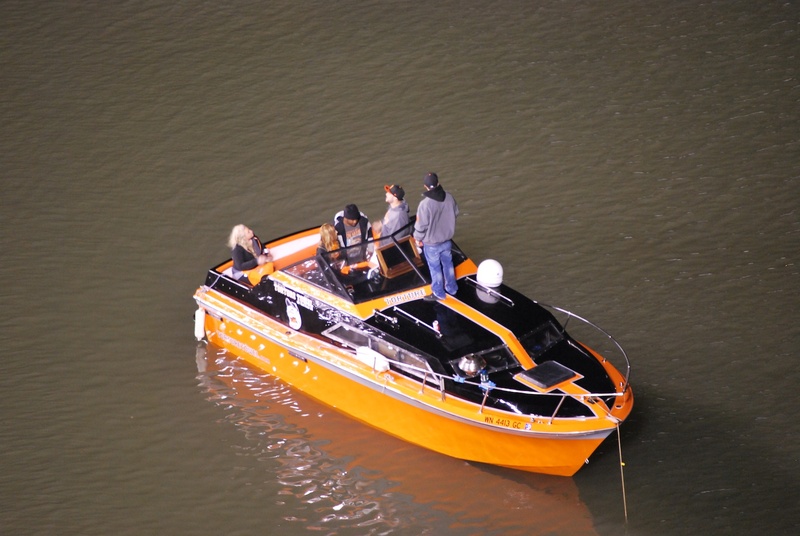 There was also a pimped out boat. The silver circular thing towards the front of the boat that’s blocking one of the windows? It’s a grill. One of the guys would occasionally head up there and flip what I assume were sausages and burgers. That’s all for now, I’m leaving for game two of the series in about 30 minutes. Gotta Go!!! 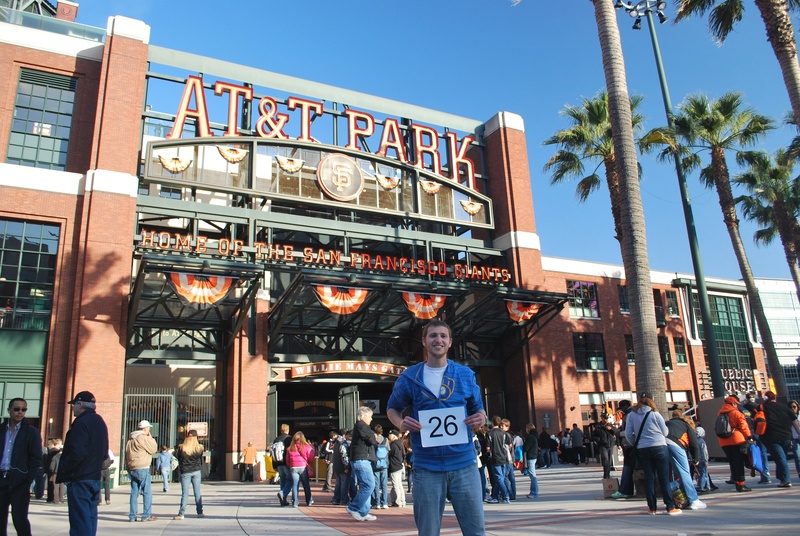 Join me on my quest to attend all 162 Brewers games during the 2012 season as I raise awareness and funds for Be The Match, a national marrow donor program.